At a meeting held by Pittsburgh City Councilor Ricky Burgess last week, the Urban Land Institute presented what they called a teaser for their recommendations regarding future real estate and economic redevelopment in the East End. “All of them revolve around issues of maintaining the character of the community — the essential character of the communities — while trying to attain affordability, both of housing stock and of business stock, and social equity in an environment where there’s a lot changing, and changing fairly quickly,” said ULI panel member Alan Razak. ULI partnered with the city, and — with the assistance of a panel of non-paid real estate experts from across the nation — spent May 8-13 in the East End, speaking with residents and analyzing data gathered by other sources on the state of its neighborhoods. 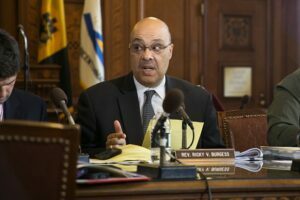 The study is part of Burgess’s HELP Initiative which came to fruition in October of last year and aims to direct development in the Homewood, East Liberty, Larimer, Lincoln, Lemington and Belmar neighborhoods to ensure affordable housing. The key recommendations in ULI’s report included: completing a plan to make neighborhood planning easier across the city, creating property tax protection, engaging with anchor institutions (with an emphasis on philanthropic organizations like universities and hospitals), combating neighborhood boundaries, working east-to-west geographically in terms of tackling neighborhood revitalization, engaging current residents and using the HELP Initiative and East Liberty Development, Inc.’s presence in the communities to their advantage. Board members from ULI walked through every East End neighborhood in their presentation, going over a series of recommendations, unique to each. They emphasized that each neighborhood has its own set of characteristics, and that these qualities should be taken into consideration before making any major changes. The researchers found a mixed sense of boundaries in the East End contributes to a disparate idea of where neighborhoods begin and end. ULI recommended the use of parks and green space to designate neighborhood lines, while connecting the communities. The study determined that the median income for Pittsburgh residents is approximately $41,000, while median income for East End residents is $23,000. Median home purchases came out to around $24,500 in East End, but home repairs and renovations for homes in the area are at around $150,000 per home. ULI presented data that suggests Pittsburgh will experience a population growth of 29,000 in the next two decades, stating that East Liberty will likely absorb most of this residential demand. Of the 3,519 housing units in East End, nearly 87 percent are occupied, and of those occupied residences, 78 percent are rentals. One million square feet of commercial property is present in East End, and ULI said the area has huge potential to develop economic growth if the the proper steps are taken. The full East End revitalization plan is currently being compiled by ULI, and the post agenda presentation is available for viewing on City of Pittsburgh’s website.